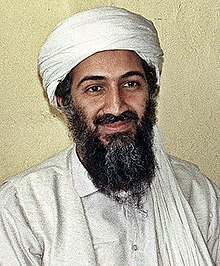 Osama bin Mohammed bin Awad bin Laden (Arabic: أسامة بن محمد بن عوض بن لادن‎, ʾUsāmah bin Muḥammad bin ʿAwaḍ bin Lādin; 10 Mairch 1957 – 2 Mey 2011) wis the foonder o the jihadist organization al-Qaeda, responsible for the 11t September attacks on the Unitit States an numerous ither mass-casualty attacks against ceevilian an militar targets. He wis a member o the walthy Saudi Bin Laden faimily an aw. Osama bin Laden wis on the American Federal Bureau of Investigation's leets o Ten Most Wanted Fugitives an Most Wanted Terrorists for his involvement in the 1998 US embassy bombins. Syne 2001, Osama bin Laden an his organization haed been major targets o the War on Terror. ↑ "In an intelligence driven operation, Osama Bin Ladin was killed in the surroundings of Abbottabad in the early hours of this morning". May 2, 2011. Archived frae the oreeginal on May 23, 2012. Retrieved May 2, 2011. ↑ 2.0 2.1 "Bin Laden Dead, US Officials Say". The New York Times. ↑ "FBI Ten Most Wanted Fugitives". FBI.gov. Archived frae the oreeginal on January 3, 2008. Retrieved May 26, 2010. ↑ Dan Eggen (August 28, 2006). "Bin Laden, Most Wanted For Embassy Bombings?". The Washington Post. Retrieved May 26, 2010. ↑ "'Most wanted terrorists' list released". CNN. October 10, 2001. Retrieved April 3, 2011. Wikimedia Commons haes media relatit tae Osama bin Laden.